This is a high quality, substantial and thick, large men's cross necklace pendant and a beautiful symbol of the cross of Calvary where Jesus shed His precious and perfect blood to cleanse us of all sin! The cross pendant measures 2" tall x 1" wide (with hoop/bale, the cross pendant as a whole measures over 2" tall). The cross arms are 5mm wide (1/4") and the pendant is 5mm thick (1/4") making it a substantial and high quality, high-polished plain cross necklace, from Apples of Gold Jewelry. The cross weighs approx. 19.0 grams of .925 sterling silver. 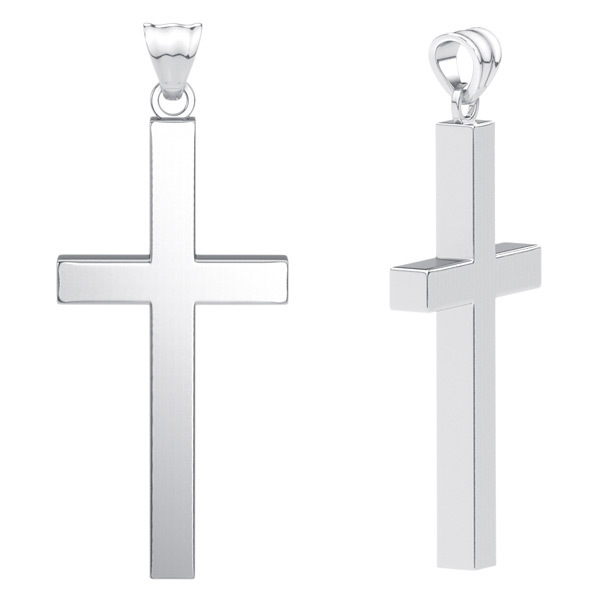 This solid men's cross is also available in 14k, 18k white or yellow gold or platinum, shown below. You can also engrave the back of the cross with a short message, such as names, dates, Bible & chapter verse, or a short message of your choice. Acts 16:30-31 reveals that we are saved by grace through faith, when we put our faith & truth in the Lord Jesus Christ: "And brought them out, and said, Sirs, what must I do to be saved? And they said, Believe on the Lord Jesus Christ, and thou shalt be saved, and thy house." We guarantee our Large Sterling Silver Men's Calvary Cross Necklace to be high quality, authentic jewelry, as described above.